Good to know our emergency services can rely on His help . Posted in Misc and tagged jesus, rescue at 4:48 pm on February 21, 2019 by Bodger. 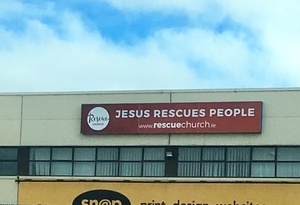 Jesus has his own rescue helicopter. No that’s the other guy…. He loves a good cup of his own tea. Heard either Donal Dineen or the Golden Maverick play it years ago. Such a great track. What the spelling? the font? The Message….. Not a fan of the font. He’s left to pick up the peices after his da causes an earthquake or tsunami, or inspires one of his followers to blow people up. When He is our Judge on the Final Day He’ll be recusing people. I’m relying on Ant and Dec picking me as their golden buzzer act. I’m not sure Jesus has any actual qualifications for sea or mountain rescue. I doubt he’d even get a job as a lifeguard. we’d all be Jewish . What about animals? What are they, Jesus? Chopped liver?